Australia's Yesterdays is the book these pictures came from. THAT ENTERPRISE IS JUST SO . What ever happened to Wizard's cars? Are they in museums anywhere? Dunno if the caption is right for that first photo......that looks more like the Gold Coast Expressway to me. But you're definitely right about the Enterprise though Boss. Norman Leslie " WIZARD " Smith is on the left with " Donald James Harkness " to his left. They are holding a...( flower coralation....!??) 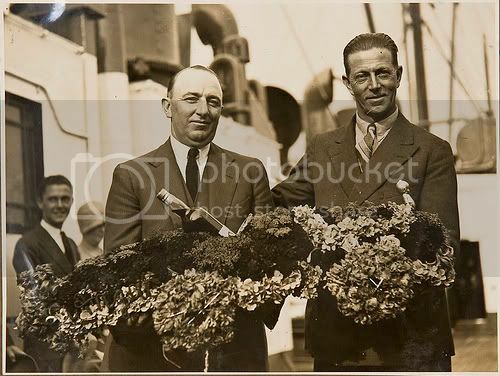 bunch of flowers which was to resemble the enterprise, while traveling on a ship to or from NZ. Donald was the designer builder of the cars & did do his time at the wheel until a nasty accident kept him on the spanners. Don Harkness is some what the key of success. On leaving school he became an apprentice in general engineering. At the age of 20 he secured employment at J.C. Hiller's garage at Drummoyne and in 1922 the partnership of Harkness & Hiller Pty Ltd was formed . "Whitey" The car pictured with Harkness at the wheel looks to be Australia's first step into LSR. 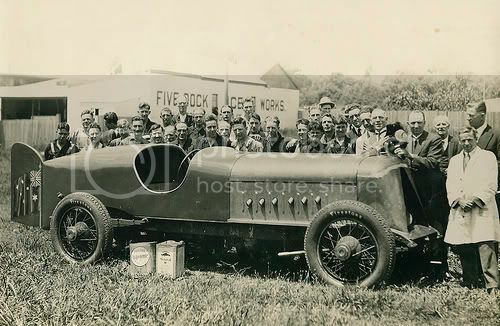 An offer of a 50 pound trophy by the Daily Guardian for the first person in Australia to break 100 mph for a measured mile , prompted Harkness to build a new car using a Minerva chassis and a Hispano Suiza aero engine .He won the trophy attaining 108 mph at Gerringong on 17 October 1925. Am yet to find a picture of this car. Lynchy wrote: What ever happened to Wizard's cars? Are they in museums anywhere? The "big" speedracer returned to Australia after the NZ record attempt . It was eventually dismantled . The engine ( Napier 1700bhp ) had been borrowed with a 1000 pound bond from the british Air Ministry . The engine was not returned to the British Air Ministry but was bought and then sold to a speed boat owner . Heres a Video I did on the 90 mile beach recently . Toheroa shells look to be thin on the ground Don. There's hope for the place yet. [i]Harkness was approached by Smith and former Lord Mayor of Sydney Jack Moyston to build a car for Smith's attempts to break the Australasian one mile and the world ten mile records . 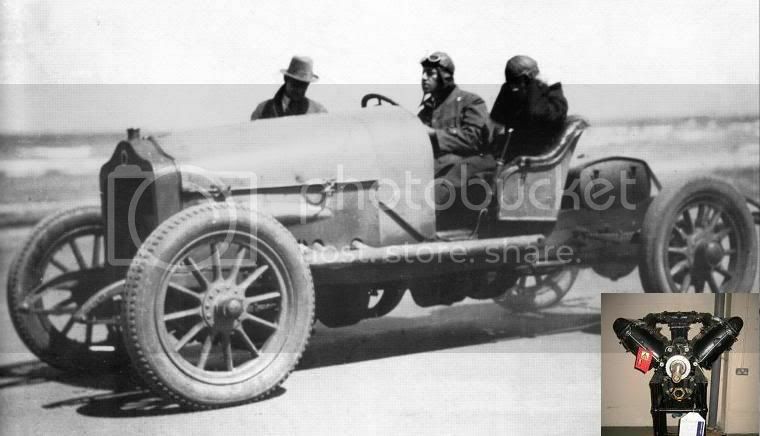 The result was the "ANZAC" with a Rolls Royce V12 Eagle 8 aero engine and a Cadillac chassis. and fitted it to a specificly constructed chassis. [i]On completion of the "ENTERPRISE" Harkness wore critisim that the car was a copy of Henry Seagrave's "GOLDEN ARROW" and at a glance there is a similarity,yet in a proper study of the two cars it is obvious the only similarities is that they both have four wheels and share the same NAPIER LION engine . [i] The car showed a beautifull presence and was celerbrated by the press , soon after it was shipped to New Zealand . In an earlier picture I wrote that Smith and Harkness were on a ship going too or from New Zealand . In the events that followed, that picture was definitly taken going too NZ. HEY Ross , Its a great story , allmost boys own adventure stuff . Where did you dig up all those pics , or is it in a book ? 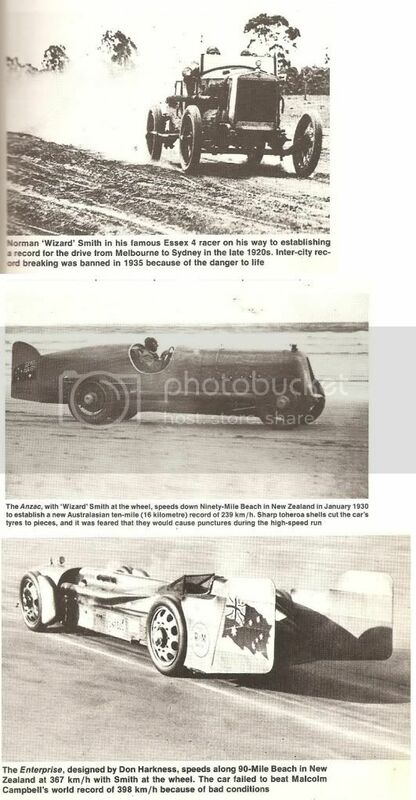 I would like to obtain as much info as possible on the 90 mile beach speed record attempts , with the view to going to the local council to have some sort of plaque or sign erected . The 90 mile beach is 100 km from where I live in Paihia . 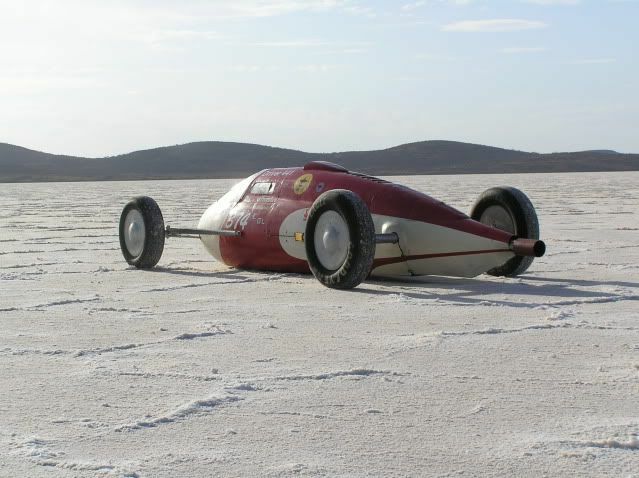 Harkness had designed & built the car specifically to break the world one mile record which was held by seagrave . 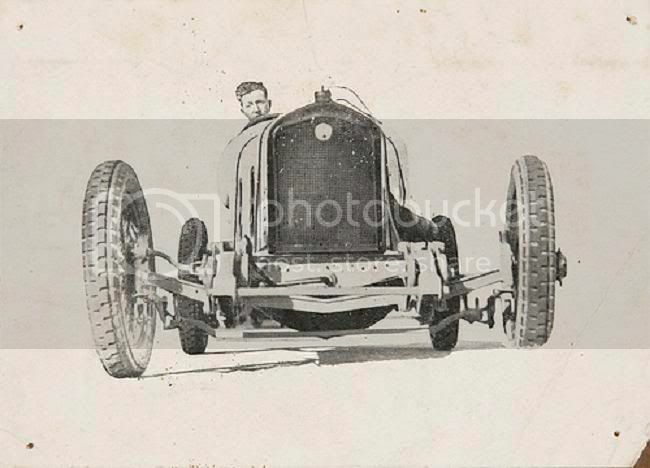 the car did however brake the world ten mile record at 164.084 mph . The celebrations were about to sour . somehow during the course of the events Harkness was absent from the car long enough for Smith and company to to fit an unsightly radiator. On sight of this Harkness returned back to Australia in disgust. A solem ending to such a great start. Bob wouldn't have let it through scrutineering with those D shackles not safety wired!!! !